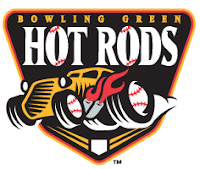 The Game: The Bowling Green Hot Rods fell to the Dayton Dragons 7-4 in Monday’s game at Bowling Green Ball Park. Despite holding the lead much of the game, the Hot Rods gave up seven runs in the later innings to lose the game. The Hot Rods took the lead in the first inning. Tyler Bortnick singled to right then advanced to second on a wild pitch. Ryan Wiegand later drove him home with a single to left to give the Hot Rods a 1-0 lead. Bowling Green distanced themselves from the Dragons in the second inning. Mark Thomas drew a walk then advanced to third on a single by Robi Estrada. Thomas then scored on a wild pitch and Estrada moved to third. Estrada also scored on the second wild pitch of the inning. Diogenes Luis singled to third to put another runner on the bases. Luis stole second and later scored on a single by Tyler Bortnick to increase the lead to 4-0. The Dragons reached the scoreboard in the sixth inning on a solo home run by Henry Rodriguez but still trailed 4-1. The seventh inning was when thing went bad for the Hot Rods. Dayton got the first run of the inning when Shane Carlson reached on an error to score Kevin Coddington. The second came from a bases loaded walk to Didi Gregorius. But the major damage came from Henry Rodríguez who struck his second home run of the game, this time a grand slam to give the Dragons the 7-4 margin of victory. Kyle Lobstein pitched 5 shut-out innings, allowing 2 hits with 3 strikeouts and a walk. Jairo De La Rosa was the losing pitched allowing 5 runs (4 earned) on 2 hits with a strikeout. Matt Stabelfeld was charged with a bad save in allowing 2 runs on 1 hit with 2 strikeouts and a walk in 2 2/3 inning. Hot Rods Player of the Game: Kyle Lobstein; 5 shut-out innings with 3 K’s. Tyler Bortnick: 3 for 5 with an RBI and a run scored. Kyle Lobstein: 0 runs, 2 hits, 3 strikeouts and a walk in 5 innings. Ty Morrison: 0 for 4, still hitless in 2010. A Look Ahead: The Hot Rods (1-4) look to avoid the sweep against the Dayton Dragons (5-0) on Tuesday night at Bowling Green Ballpark. Alex Colome will start for Bowling Green against Josh Ravin (0-0) of Dayton. Please check the part where you typed "RP Top Prospects to Watch." Kyle Lobstein only gave up 2 hits, not 5 hits. Thanks.